Indeed it does. To many victims and allies, the Pope's silence is galling. As fissures emerge within the Church hierarchy, many in the media have sought to frame this story as an internal fight pitting doctrinal and cultural conservatives against a more progressive faction, of which Francis is the leader. There is certainly some validity to that dynamic, but the internecine struggle among various clerical factions is far less important than the underlying moral crisis that represents a growing, malignant tumor on the Church. Yet the Pope and others often appear to be treating it as little more than a public relations snafu that's being calculatingly inflamed by agenda-driven opponents -- rather than an unfolding catastrophe that's marring the Church with an indelible stain. 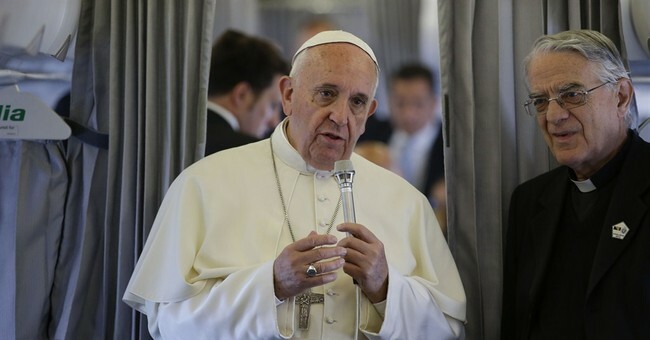 To wit, in a sermon this week, Francis admonished "the Great Accuser:"
In his homily at Mass on Tuesday morning, Pope Francis said it seems the "Great Accuser" is attacking the bishops of the Catholic Church to create scandal. The Pope invited the bishops to remember three things in these troubled times: their strength lies in being men of prayer; they should have the humility to remember they are chosen by God; and they need to remain close to the people...Pope Francis said bishops need these three attitudes to face the scandal whipped up by the Great Accuser: "In these times, it seems like the 'Great Accuser' has been unchained and is attacking bishops. True, we are all sinners, we bishops. He tries to uncover the sins, so they are visible in order to scandalize the people. The 'Great Accuser', as he himself says to God in the first chapter of the Book of Job, 'roams the earth looking for someone to accuse'. It appears that pro-Francis forces within the Vatican are now pushing back, seeking to pin some blame on the previous regime. Indeed, one of the (deeply cowardly, in my view) arguments from the "calm down and contain our dirty laundry" crowd has been that a full, ugly, public accounting will implicate and embarrass prominent Church officials from across the spectrum. The strong implication has been, if you come after person X, you might expose people Y and Z, so be careful what you wish for. To which the only correct riposte is: Good. So be it. If "liberals" within the Church knowingly endangered children by covering up numerous crimes and abominations, they must be rooted out. Now re-read that sentence and simply replace "liberals" with "conservatives." This issue is far bigger, and far graver, than petty factionalism, or even serious doctrinal disputes. Those who fail to see that reality also fail to appreciate the magnitude of the damage being done to the reputation of the Church. I'm not a Catholic, but many of my dearest friends are, and I've attended countless masses over the years. I am not hostile to the Church; indeed, quite the opposite. I see it as an indispensable institution and a desperately-needed force for good in the world. But for the Church to perform its crucial functions of faith and works in an effective manner, it must be seen as -- and, in fact, must be -- morally righteous. Right now, the Church is hemorrhaging credibility and surrendering its standing. My instinct is that aside from those who are personally invested in the secondary and tertiary skirmishes, most observers don't much care which "side" is responsible for the egregious derelictions that have led to this moment. They care that the abuses, the derelictions, and the pervasive mentality that enabled them, be fully laid bare and stamped out. “I feel very much at peace at this moment. I am sleeping OK,” Cupich said, according to the person in attendance, a man studying to be a priest, who recalled that some fellow seminarians shook their heads in “disbelief.” The source said Cupich also told the group that, while the church’s “agenda” certainly involves protecting kids from harm, “we have a bigger agenda than to be distracted by all of this,” including helping the homeless and sick. That account was confirmed by other sources, including another seminarian also present at the gathering. That's not tone deafness. That's deep, festering moral blindness. God help the Church.